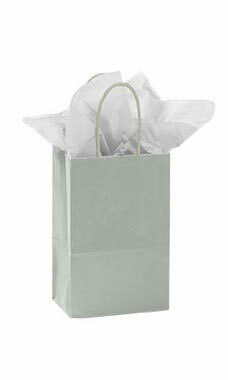 Small Silver Glossy Paper Shopping Bags are the perfect retail shopping bag for trinkets, small gifts and more! Constructed of durable glossy paper with twisted handles that features a silver glossy finish with a white interior these shopping bags are perfect for any boutique or retail store. Add tissue paper and ribbon and you instantly have a gift bag. Sold in a case of 100 bags. We also offer custom paper bags where you can add your logo, messaging and more. Check out all of our Custom Creations to build a comprehensive look that will make your store stand out from the competition!